Brainlab is excited to introduce a comprehensive solution for the treatment of multiple brain metastases at the ESTRO Annual Meeting. 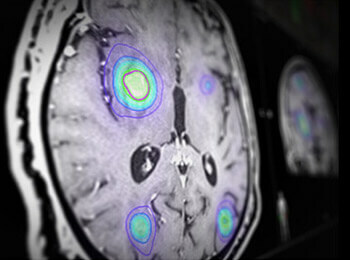 Come experience the combination of the revolutionary Automatic Brain Metastases Planning software with the well-established ExacTrac® IGRT system, offering a precise and efficient way to treat multiple brain metastases.The Automatic Brain Metastases Planning* tool enables the straightforward treatment of multiple metastases, reducing planning time and dose to the patient. The new software rapidly creates consistent treatment plans, minimizing dose to normal tissue and offering new treatment possibilities for larger volumes and higher numbers of metastases.During radiation delivery, ExacTrac provides a means to detect intra-fractional motion via internal X-Ray verification, regardless of the couch or gantry angle. A high level of integration with the linac and R&V system provides a quick and seamless automated workflow with the possibility of 6D correction.Brainlab welcomes you to our booth #3460 to experience how the Brainlab radiosurgery product portfolio can help enhance your clinical routine. *FDA clearance pending.